Research released by University of Technology Sydney (UTS), reviewing International Convention Centre Sydney’s (ICC Sydney) all-encompassing Feeding Your Performance (FYP) program, has heralded the venue as a blueprint for innovation, delivering economic, social and environmental advances for Sydney and New South Wales (NSW). 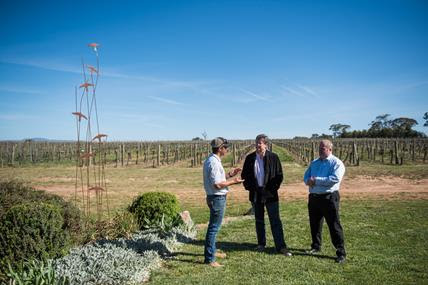 ICC Sydney CEO & Sommelier meet with regional farmers. Embedded across ICC Sydney’s operations, the FYP program strives to feed the performance of ICC Sydney delegates and visitors, team members, and the local economy, through a unique New South Wales-focused supply chain, a progressive sustainability approach and an industry-first Legacy Program. The report noted ICC Sydney delivered a total A$8.3 million to the NSW economy in 2017 through its food and wine purchases. This represents a direct investment of more than $A4.3 million in a network of more than 85 NSW producers and farmers. Overall, delegates attending events at ICC Sydney generated A$785 million in direct expenditure for the State in its first year of operation. NSW Minister for Primary Industries, Regional Water and Trade & Industry, Niall Blair applauded ICC Sydney’s approach and said the research reinforced the venue’s reputation for innovation and excellence across the board. “ICC Sydney is pioneering a commercial model which is driving a triple bottom line, delivering significant economic, social and environmental gains for New South Wales, and establishing a benchmark for best practice across sectors. “For example, ICC Sydney’s approach to working hand-in-hand with local suppliers could be adopted by other venues to provide financial security for farmers and producers, driving employment and growth opportunities in regional areas. The culinary aspect of the FYP program is also showcasing the state’s outstanding produce on the global stage and creating new markets for agriculture and tourism,” he said. ICC Sydney CEO, Geoff Donaghy believes it is vitally important that convention centres measure the full impact they have on their supply chain. “We are immensely proud to be looking beyond the borders of Sydney to feed the business performance of our suppliers as well as the communities in which they’re located. Increasing cash flow for farmers and producers, boosting production and supporting improvements to infrastructure. Focusing on recycling, reduced use of chemicals, reduced waste and effective waste management. Unique multi-streamed Legacy Program providing event organisers with opportunity to partner with local organisations through four diverse streams – Innovators & Entrepreneurs, Generation Next, First Australians and Sustainable Events. Donaghy said key to the venue’s ongoing success will be driving continuous improvement.